Just because you CAN do something doesn't mean you SHOULD. However, it's always nice to do something crazy so that you can better understand a system. Warning: There is no warranty implied here. I'm loading the gun and showing you where to point it. If you point it at your foot, that's your business. Safety mechanisms exist for a reason and if you're going to to use this tip to just "get an app to work" but you're not sure why it's broken and you're just flipping switches to "get'er done" then step backwards out of the minefield and hug your family. Don't trust user input and don't let users submit unencoded script or markup. I got a question from a fellow at Webcamps China about why he couldn't put in a URL. He wanted to do something like : http://localhost:39090/Default/%3Cb%3E That's a as in "%3C b %3E" were the %3C is < and %3E is >. Notice he's asking to put this in the Request Path, the URL, not in the Query String. 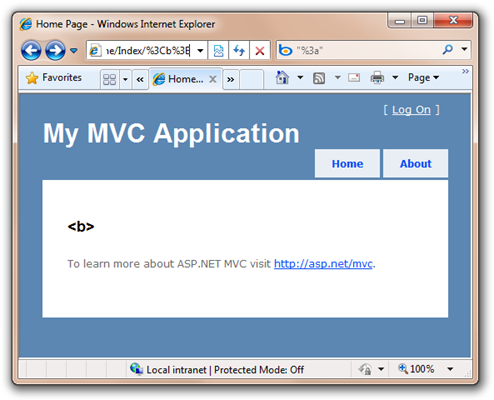 If I create a quick ASP.NET MVC 2 app (this could be done in WebForms also) and issue http://localhost:39090/Default/%3Cb%3E I get this HTTP Error 400. Notice it's not a standard YSOD, it's a simple error message. 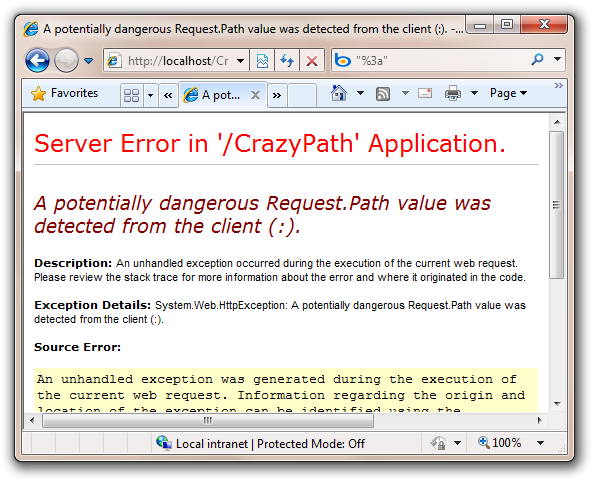 This error was caught and issued early in the pipeline, before ASP.NET proper got involved. 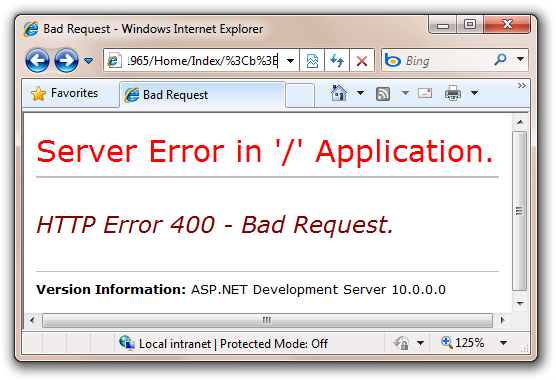 In this case, I'm using the development web server, but I'd get a similar error from IIS proper. If you really know what you're doing and you know WHY you're doing it, you can turn Request Validation off in a number of ways. Then, if you are using WebForms, you can turn it off totally at the application level in your web.config. If you're using MVC, you turn it off Input Validation using the [ValidateInput(false)] attribute on a class or a method. In this case if I turn it off on my method, it works and I can pass the encoded as %3Cb%3E directly in the Query String, but STILL not in the Request Path as that's a different path through the server. By default the "requestPathInvalidChars" attribute contains seven characters considered invalid (the less than and greater than signs as well as the ampersand are encoded since configuration is an Xml file). Those are on the httpRuntime element, and the attribute is requestPathInvalidCharacters="<,>,*,%,:,&"
to this, removing the <, >, and %. Which will trigger the double-decode detection alert since the Url will mutate again if it is Url-decoded a second time. To suppress that error you need to add the following to configuration as well. requestFiltering allowDoubleEscaping="true"
However, at this point, you're turning off all sorts of things, and are in danger of making URLs that just shouldn't be. ;) You may also have a latent canonicalization bug floating around in your code if you head down this road. But does it work? It doesn't work under Visual Studio Development Web Server as the system.webServer section only applies to IIS7. If I deploy my ASP.NET MVC application to IIS, it starts to work as I get into my controller action, but then as I return the ViewResult via "return View()" it fails deep inside of ASP.NET proper as the WebFormsViewEngine's ViewPage implementation of RenderView() ends up calling Server.Execute which calls HttpRequest.MapPath. MapPath assumes there's an underlying file and calls InternalSecurityPermissions.PathDiscovery().Demand(). This contains a FileIOPermisson which checks for illegal characters. Since you can't have a file that contains a < or >, it fails. Bummer. Oy, if you're not afraid now, be afraid. If you're made it that far, again, you're on your own, turning safeties off, yada yada, mercy on your soul, etc. And I'm saved, finally, by the new HtmlEncoding syntax <%: rather than <%=. The <%: mystring %>syntax in ASP.NET 4 is equivalent to <%= Server.HtmlEncode (mystring) %>and since it's the default, my UrlEncoded was HtmlEncoded on the way back out. After ALL this effort to get crazy stuff in the Request Path, it's worth mentioning that simply keeping the values as a part of the Query String (remember WAY back at the beginning of this post?) is easier, cleaner, more flexible, and more secure. Enjoy, take care, and please don't point that at me. All that work so people can send evil scrips to your code. Thanks for this. 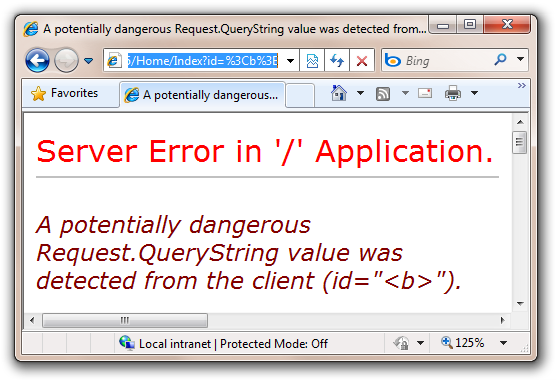 I have a customer that is insisting on using an asterisk as part of a querystring parameter. I just wish I could intercept the ugly 400 error page and display something more user friendly. a lot of interesting things, as usual, thanks ! I encountered these issues when porting my existing blog to MVC to utilize URLs for titles. Many of the titles had "odd" characters in them and I ran into the URL validation errors myself. Ultimately, I ended up writing a custom method to replace the odd characters before using them in the URL, so that I could enjoy the benefit of not going through the pain described above and utilize the built-in validation provided by IIS, ASP.NET and MVC. Hi, on a related note is it possible to disable/tweak validation for an individual 'button' on a page? I've been trying to create a working 'HTML button element', which as everyone knows doesn't play nice in IE6 (and maybe IE7) because it posts back it's innerHTML rather than it's value attribute. This is fine until you put HTML inside of your HTML Button element, and then the validation kicks in and says it's an unsafe request. Of course validation could be disabled on the page, but I'd rather keep validation, and just ignore it for the HTML Button post data. The main reason of using a HTML Button (pure without js hacks) is that is allows for a lot more flexibility with styling. Very helpful and nice article. This blog is really helpfull like this one, http://geekswithblogs.net/mbridge/archive/2010/11/02/error-message---a-potentially-dangerous-request.querystring-value-was-detected.aspx. I get many good instruction from this blog too. Hope it helps!! Is it be related with 64bit windows?